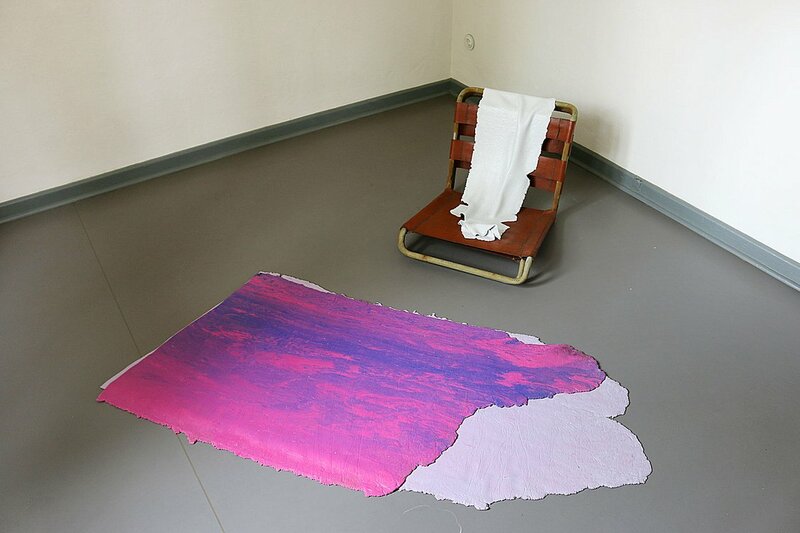 YANE CALOVSKY, Mazedonien – INTERVIEW about his Project: To fold within as to hide. Project: "TO FOLD WITHIN AS TO HIDE"
In what kind of household are you living? And what is modern/contemporary about it? I live in a single bedroom apartment in Skopje, with my partner Hristina Ivanoska, who is also an artist, and our 5-year old son Teodor. Our place is very efficient in its spatial organization, as we have invested to design it and make it functional for our family to be able to live, play and work. Since it is not very large the most important design aspect was to make the space multifunctional and have objects and appliances that are energy efficient and multi-purposeful. We are also traveling a lot due to our work and that leads to something like a nomadic life-style, which is very inspirational as we encounter various other living and working conditions that are almost always designed to easily transform and meet our needs. Do you think that you are living in a healthy and economical way? We try to. We are constantly aware of keeping our life style healthy and economical, since we experience the world around us an extension of our own private environment. We teach our son that saving the planet starts at home, with how we manage our own living. We try our best to live healthy and environmentally friendly. But living healthy and economically is a political concern as well, as we know that we are all implicated in devastation of the global environment. I am avid advocate for considering how our personal decisions are distributed within the global neo-liberal environment. I think paying attention to what we have, how we use it and also taking care that our food is locally grown and produced (we buy our fresh produce from private farmers) is the key to living healthy and economically. What kind of household are the visitors entering when they go in your exhibition room? I think the visitors do not enter into a household, but more of an installation setting within a house which in turn, is a historical setting, or an exhibition within an object. The work presented hopefully ignites a conversation in regard to the way the old and the new are always in dialogue. So the primary aspect of my recent work ‘To Fold Within as to Hide’ (2015) is developed in response to the control and preservation strategies applied in context to historical narrative of the Schlemmer house, as one of the settings for project ‘Haushaltsmesse 2015’. Since the house is empty I wanted to symbolically occupy it with objects that I call ‘associative” as they share a specific past within the culture and history of Bauhaus architecture and design. I also wanted to bring something that I have been working on, and that is the research into synthetic rubber as a sculptural material and ultimately create a work that would address the transdisciplinarity of household and their understanding as archives of knowledge production. In your work rubber is getting in contact with other things. Why do you use rubber as material? Why is it fascinating you? There is an aspect of the rubber pieces that are both concealing and reviling the sources they are in contact with. Also, this rubber is very sensitive and elastic so it reacts to touch and contact in general. Made as a floor and object coverings, the synthetic rubber, designed and fabricated at a small family workshop in Skopje (and first used in the work ‘Erasure Bed’ from 2014) is placed in formal sculptural-assemblage setting with the defaulted objects form the Bauhaus Archive within the architectural setting of the Oskar Schlemmer’s Master house in Dessau. Furthermore, within this process of merging found object and manufacturing of new material, I want to rearticulate concepts such as occupation, reorganization, adaptation, and attribution of ideas. By questioning what it means to ‘draw’ and draw from’ as well as ‘drawing within’ a pre-existing cultural setting, my work becomes closely linked to practice-based research. The historical context of how rubber has developed, how it was globalized, is important to me for many reasons, political, social and economic. It can be a whole different evaluation of my work seen from this aspects of political presence of objects and materials. But, to answer your question, one of the things that fascinates me is the formal elasticity of the material and the metaphorical meaning of erasure imbedded within the material. It is also a ‘forgiving’ material, because of its identity as a functional and corrosive material. It anticipates its own demise. So it is interesting to see how for a moment it can relate to something else while have its own transformative process in real time. The mystery life of the objects: The rubber seems to occupy the room, it moves over different furniture. What is the difference or the similarity between the materials, the rubber and the older objects? The Bauhaus archive on one hand is filled with defaulted architectural and design materiality (objects and systems of function from former buildings) that for me become ‘triggers’ as to how something may be remembered and resurfaced in a new setting. Archives are not only depositories, they are also growing systems of values. While the one of the main concerns of the work is ‘reactivation of knowledge’, or formulated as a question: how, why and to what degree, we preserve the function of discarded matter and emotions (some of it text based, some found objects)? In this specific case, the rearticulation of objects produced in the height of modernism and in context to various Bauhaus buildings (such as the flooring material trioline, a fire-escape ladder, or the Michael Brauer pipe-chairs) is extended in context of the post-modern notion of household – not only private but also a public, or rather, a global space of production.